Nearly everyone who smokes cigarettes knows about the health risk, and almost all of them know they should stop smoking as soon as possible. Unfortunately, however, the high stress levels of modern life, along with the addictive quality of cigarettes makes it extremely difficult to quit. Most people cannot do cold turkey, so some will get drug therapy, while others will “wean” themselves off slowly. However, here are some quick tips to help you through the process. Sip and snack. Sip ice water through a straw all throughout the day and eat small, healthy snacks when the urge hits. Get a lifeline, a friend (preferably a former smoker), to be your go-to person when you want to light up. Don’t drink alcohol while trying to quit. Most people smoke more when they drink. Also, alcohol impairs judgment and lowers the will-power, so lighting up will be easier after a few drinks. Exercise is a great and healthy distraction from the cravings. Keep a visible list of benefits to quitting. Maybe your spouse or kids have talked you into it because they’re worried about your health, so keep a picture of them close by at all times and look at it when you have a craving. You could also keep a picture of cancerous lungs to look at when you want to light up. Use what is going to make you more likely to cringe at the thought of smoking. Brush your teeth a few times a day. 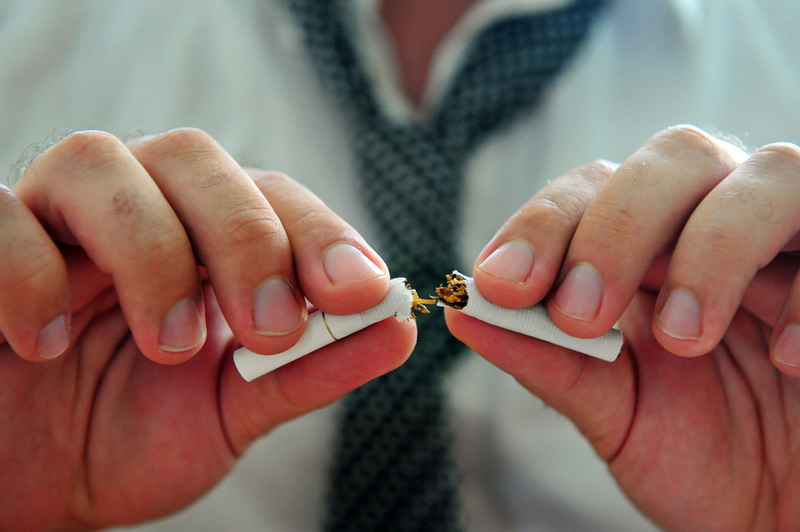 A fresh mouth helps reduce the urge to smoke. You could also eat a mint or chew gum with the same effect. Create a non-smoking area in the office or home, so when the urge hits, you go there to do a non-smoking activity like read or play a crossword puzzle. Be aware of your mood. You’re likely going to be cranky in the first couple of weeks. Talk to your family, friends, and coworkers about it so they can help you recognize when a mood swing comes. Then, do something to distract yourself, like take a couple of deep breaths, snack, chew gum, or call your lifeline. Patience is the virtue. The reward for patience is patience. Be kind to yourself through this process and believe in your ability to do it. If you relapse, don’t beat yourself up. Figure out what the trigger was and focus on fixing that. Quitting is not easy, but you don’t have to do it alone. As a concierge physician, I can act as your lifeline or help you with drug therapy like Chantix, patches, or other modes for quitting. Call for an appointment to talk about your options. I’m available 24/7.